Golf Fairfax rolled out the purple carpet for 175 women who joined us to grow and celebrate the game of golf at the inaugural Women & Golf Reception, held June 13, 2018 at Laurel Hill Golf Club. Women of all playing levels, from seasoned pros to those who had never held a golf club, enjoyed the relaxed atmosphere filled with music, laughs, lessons, and new and old friends. The day was designed to encourage and build confidence to “swing like a girl,” take a lesson, join a league, attend a social, sign up for a tournament and create a golf network, because while the number of golfers nationwide may be shrinking, the number of women golfers is growing. And women have the power and influence to continue to grow the game. Women are 38 percent more likely than men to introduce children and teens to a sport. The event showcased the Fairfax County Park Authority’s seven unique golf facilities (Burke Lake Golf Center, Greendale Golf Course, Jefferson District Golf Course, Laurel Hill Golf Club, Oak Marr Golf Complex, Pinecrest Golf Course and Twin Lakes Golf Course) and their offerings to women and junior golfers, including women’s and junior leagues, socials, tournaments, camps, clinics and classes. Guests connected and networked with representatives from seven courses, LPGA Women Who Play, Women on Course, Women’s Congressional Golf Association and The First Tee, who joined in to support the mission to create an inclusive, fun, social community for women, kids and teen golfers of all levels. Complimentary clinics hosted by our LPGA, PGA and USGTF professionals at Pinecrest Golf Academy, Everybody Golf School, Greendale Golf, Eisman Golf Academy and Callaway, excited and invigorated the crowd with tips and tricks on putting, chipping, driving and Yoga for Golfers. Ladies walked away with a goody bag filled with golf supplies to get the ball rolling, awesome giveaways donated by our sponsors, newfound confidence, and as part of a growing network of women golfers. Shifting to female focused groups, initiatives, organizations and efforts dedicated to welcoming, developing, celebrating and encouraging women golfers. We at Golf Fairfax want to embrace that shift to create a comfortable, inclusive environment, women-specific events, out of the tee box programs and socials to celebrate current, potential and new golfers and to grow and connect our own women’s golf network through fun interactive events. We are pleased introduce our new webpage www.fairfaxcounty.gov/parks/golf/women, a one-stop-shop for all things Women & Golf Fairfax. We want to extend a huge thank you to all who helped to make the day a success including our golf courses, exhibitors and main sponsors, Dominion Wedding Entertainment, Callaway Golf, Teeoff.com and The National Golf Foundation. Look out for more Women & Golf Fairfax events coming to a course near you! 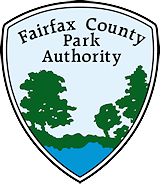 Author Roberta Korzen is the Fairfax County Park Authority Golf Marketing Specialist. This entry was posted in Uncategorized on June 29, 2018 by Fairfax County Park Authority. Managers of Lake Fairfax are considering taking steps to improve the fishery at the popular Reston, Virginia park. The first step in any such plan is to find out what’s there. To do that, the Fairfax County Park Authority turned to the Virginia Department of Game and Inland Fisheries. VDGIF Fisheries Biologist John Odenkirk, Mike Isel, and Robert Willis visited Lake Fairfax Park on Monday, June 11, 2018 to conduct a fish survey. This entry was posted in Uncategorized on June 25, 2018 by Fairfax County Park Authority. Gardening makes me happy. I think about, dream about, and plan for it all the time. If I was 40 years younger, I’d become a horticulturist. After retiring years ago, I enrolled in the Green Spring Gardens Master Gardener course through Virginia Cooperative Extension. I loved everything about the course — the speakers, my classmates, being at Green Spring Gardens, even the studying. I realize it was easier when I was younger to retain information. I am older now, but hopefully aging gracefully. My grandfather gardened into his early 90s. My mother lost her physical ability to garden at 88 but not her interest. She took her walker and had a chair carried outside. She directed her grandson where to plant, how to prune and when to enrich the soil. He now has his own home and a fabulous garden. She was fortunate to have that resource, and he learned valuable lessons from her. As I rapidly approach my 70s, I realize I can’t haul the 40-pound bags of top soil the way I once did. Holes get harder to dig, and I ache after a day working in the garden. There are so many benefits for older people who keep gardening. It’s an enjoyable form of exercise. It encourages use of all motor skills. It maintains strength, reduces stress, encourages an interest in nature and can provide home-grown produce if you grow vegetables. We made adjustments for my mom. Raised beds helped her garden from her wheelchair. Plant boxes were installed around the deck. Her tools were refitted with foam, tape and plastic tubing for a truer grip. It is now easy to find ergonomic tools that are lighter and protect joints during the repetitive motion that occurs while gardening. This year, I’m reducing my use of annuals and replacing them with perennials. I’m certain in the years to come I will remove the perennials and replace them with shrubs for even less maintenance. I read Sydney Eddison’s book, “Gardening for a Lifetime: How to Garden Wiser as you Grow Older.” Eddison is a lifelong gardener. She writes about her experiences and presents tips that are realistic and encouraging. It’s a great read for the Medicare age gardener and for younger gardeners with jobs, kids and little extra time. There are adjustments you can make for easier gardening. If you have the space, raise beds to avoid bending and stooping. Containers provide control of soil, water, exposure and even the plants. This season, I invested in a good garden cart. Each time I use it I’m thankful that wheels were invented. It carries tools, plants, weeds, soil, even my snacks. This year, I added seeds to my garden. I sowed half a pound of zinnias. I have hundreds of seedlings, and I’m anxious to see how the flowers thrive. It was an easy project. I’m now conscious of safety items that gardeners of all ages should remember. Prevent excessive sun exposure by working in the garden early in the morning or late in the day. Wear a hat and sunscreen. Keep hydrated by drinking water, and take care in the use of power tools. My garden gives me great joy and is not yet a burden. I need to continue to make changes so that I can garden for my lifetime. Author Gioia Caiola Forman is a Virginia Cooperative Extension Master Gardener at Green Spring Gardens and a board member of the Friends of Green Spring. This entry was posted in Uncategorized on June 20, 2018 by Fairfax County Park Authority. There’s nothing like a housewarming gift to make a house start to feel like a home. McCullough is the first of what the Park Authority hopes will be many Resident Curators of its historic properties. The underused properties selected for the Resident Curator Program (RCP) have historic value, but the Park Authority has not had the means to preserve or manage them for public access. The RCP finds people or organizations with the skills to refurbish the properties and allows them to use the properties rent-free while sprucing them up. In return, the resident curators agree to allow limited public access to the historic properties so residents of the community can learn about the history of these buildings. Since McCullough signed his lease on December 3, 2017, he has been keeping a blog, “Stempson House: A Resident Curator’s Journey,” that charts his work on the house. The Stempson House was originally built as part of the Lorton Reformatory and Occoquan Workhouse. Likely constructed by inmates, it was a home to one of the prison guards and later converted to office space and used as the security office. “Projects included about 40 hours worth of scraping the walls of ceilings of cracked and peeling paint, plaster and old joint compound and about 32 hours of skim coating and priming followed by a fresh coat of paint on all the walls and ceilings. The upstairs has fresh carpet and all the hardwood floors on the first floor and staircase have been sanded and are ready for stain and refinishing. The kitchen is looking like a kitchen with brand new tile floors, base cabinets are in place and secured and granite countertops were just installed yesterday. I’m just waiting on my appliances and to hang the wall cabinets and the kitchen will be almost complete. The bathtub and surround were reglazed and looks practically brand new. McCullough received his certificate of occupancy at the end of February and moved in soon after. He lives there now with his daughter, dog and cat. Since his January blog post, McCullough has finished work on the kitchen and is turning his sights on some exterior work this summer. His project list includes repairing and repainting the screened porch and wood deck. He has planted a new flower bed and will work on removing all overgrowth and vegetation from the house and surrounding landscape. With added curb appeal, this property is definitely moving from Stempson House to McCullough’s Stempson home. Author Carol Ochs works in the Park Authority’s Public Information Office. This entry was posted in Uncategorized on June 13, 2018 by Fairfax County Park Authority.